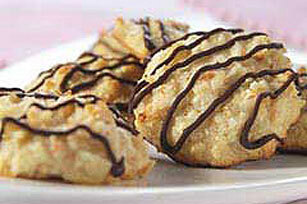 Toasted macadamias add crunch to these classic coconut drop cookies. The cookies are drizzled with melted chocolate for a special touch. Spread coconut and macadamias into 15x10x1-inch pan. Bake 10 min. or until lightly toasted, stirring frequently. Cool. Combine milk and vanilla in large bowl. Add coconut mixture and cracker crumbs; mix well. Beat egg whites in small bowl with mixer on high speed until stiff peaks form. Add to coconut mixture; stir gently until well blended. Drop rounded tablespoonfuls of dough, 2 inches apart, on lightly greased baking sheets. Bake 12 to 14 min. or until edges of cookies are lightly browned. Remove to wire racks; cool completely. Melt chocolate as directed on package; drizzle over cookies. Place in waxed paper-lined shallow pan. Refrigerate until chocolate is set. Prepare using BAKER'S Bittersweet Baking Chocolate.